This necklace is an absolute statement maker. 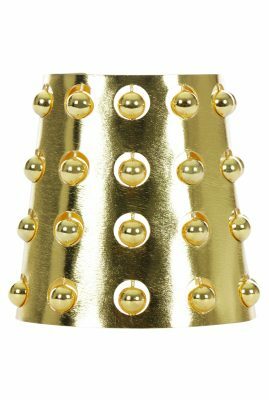 Made by hand in her atelier using brass plated in solid 24 karat Colombian gold, Liza Echeverry has a penchant for experimenting with geometric forms. With strong lines and angles, this necklace neatly encapsulate female empowerment, albeit in delightfully subtle ways. Inspired by the Pre-Columbian filigree golden artwork attributed to the Zénu tribes, the Leticia Necklace symbolises the importance of the weaving technic linked to the indigenous everyday life, rituals and the building up of knowledge by their leaders. 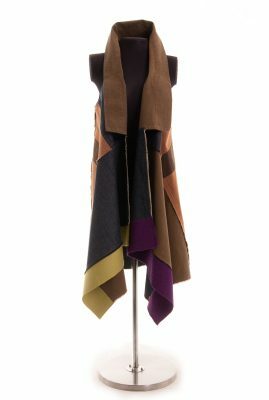 For them weaving is like recreating the idea of the universe by bringing together knowledge, nature and material. 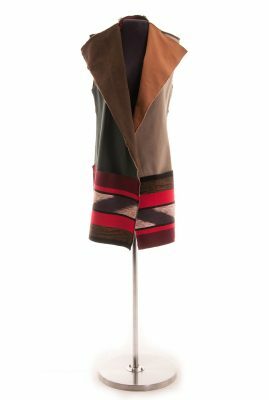 Weaving both makes and represents culture. 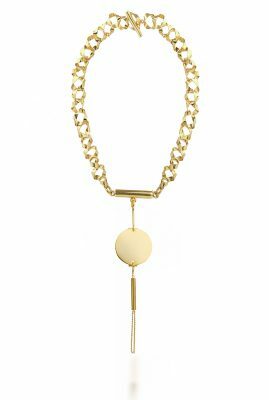 The 24k gold plated Leticia necklace represents an ancient history with a contemporary edge. Extravaganza Deluxe! The 24k gold-plated Gaia choker is inspired by the Greek goodness of Mother Earth. In Greek mythology Gaia was the goddess personifying the Earth and who gave birth to the Titans. The Gaia philosophy conceptualizes that all living organisms on a planet co-exist to benefit of the whole. This unique 24k gold-plated Gaia choker represent an ancient myth and combines traditional craftsmanship with a contemporary edge. Extravaganza Deluxe! 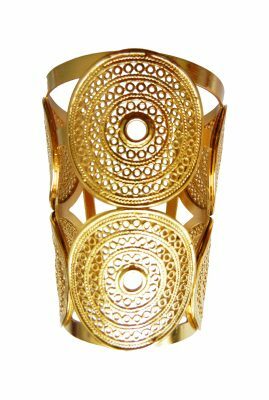 The Cacique cuff is a 24k Gold plated artwork attributed to the most powerful leader of the indigenous group during the Tairona period; the Shaman, who claimed to control the essential forces of nature, the order of the cosmos and human action. A symbol of power, influence and respect. The Cacique portrays the Shaman in a state of trance and transformation in the emblematic bat-man figure seen as the lord of the darkness and of the underworld. A unique handmade ring inspired by a mythical Pre-Columbian history with a contemporary edge. Extravaganza Deluxe! 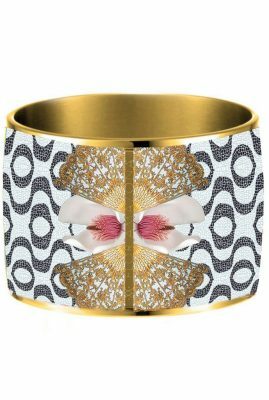 The design of the Macondo cuff is inspired by the «El Dorado« legend. A pre-Columbian legend telling the story of a Muisca king, who used to be the leader of one of the indigenous tribes high in the Andes Mountains. He would cover himself in gold dust during festivals and then dive from a raft into Lake Guatavita in Colombia. Also, pieces of gold and precious jewels were thrown into the lake to honor a god that lived underwater. 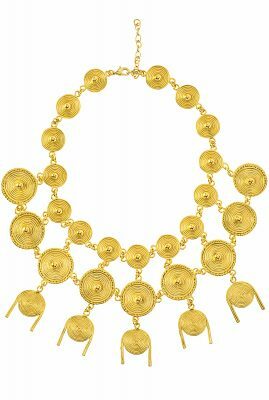 The Macondo Round Charm symbolizes opulence and luck in pre-Columbian tradition. 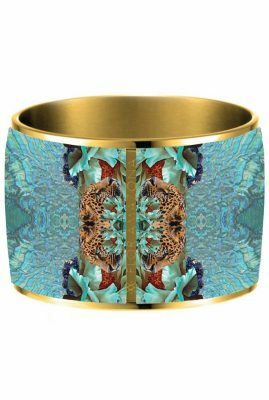 A unique handmade 24K gold plated cuff inspired by a mythical history with a contemporary edge. Extravaganza Deluxe! The Chia cuff is a must have item. Its design has been inspired by the ´El Dorado´ legend and named after the pre-Columbian goddess Chia “the goddess of the moon.” The little balls spin on their axis the same way the moon does. 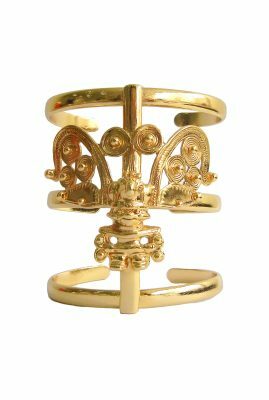 A unique handmade 24K gold plated cuff inspired by a mythical history with a contemporary edge. Extravaganza Deluxe! 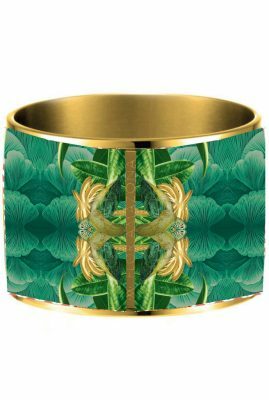 Both exotic and chic, this beautiful enameled Rio Mornings bangle is a true statement piece. This 24kt. gold plated bracelet has been inspired by the mysterious and enchanting mornings of the Amazon with its beautiful sunrises, its golden anchors and the enlightenment of the sunrays falling down on its palm trees. This unique gem adds a jazzy flavor to any outfit- day or night. 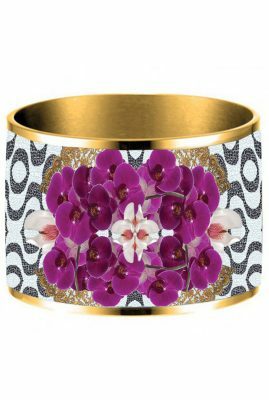 For a fiercely glamazon and cheery effect, you can mix and match multiple enamel bracelets. Enameling is a delicate process. As such, it can take up three to four days to produce one single enamel bangle. 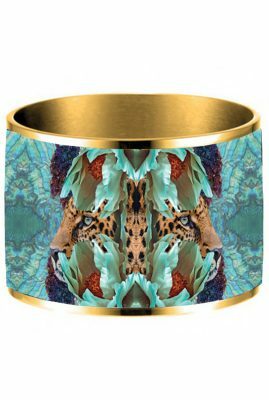 Both exotic and chic, this beautiful enameled Jaguar Nights bangle is a true statement piece. The ferocity of the jaguar has served as inspiration for the creation of this 24kt. gold plated bracelet. 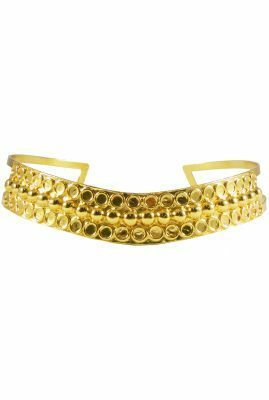 A classic enamel bangle with a twist, fusing the easy and carefree lifestyle of a gypsy with the sophistication of the jet set. This unique gem adds a jazzy flavor to any outfit- day or night. For a fiercely glamazon and cheery effect, you can mix and match multiple enamel bracelets. Enameling is a delicate process. As such, it can take up three to four days to produce one single enamel bangle. 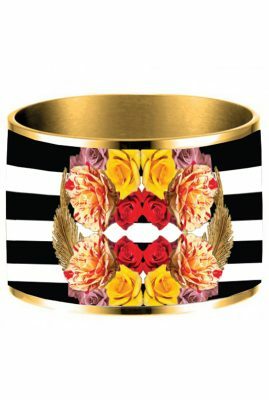 Both exotic and chic, this beautiful enameled Rio & Roses bangle is a true statement piece. The bright flashing lights of the city of Rio de Janeiro and the elegance of red roses served as inspiration for the creation of this 24kt. gold plated bracelet. This unique gem adds a jazzy flavor to any outfit- day or night. For a fiercely glamazon and cheery effect, you can mix and match multiple enamel bracelets. Enameling is a delicate process. As such, it can take up three to four days to produce one single enamel bangle. 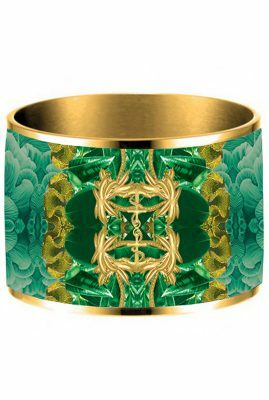 Both exotic and chic, this beautiful enameled Copacabana bangle is a true statement piece. The iconic Copacabana Boulevard in Brazil and the hyper elegant Cattleya orchid served as inspiration for creating this 24kt. gold plated bracelet. This unique gem adds a jazzy flavor to any outfit- day or night. For a fiercely glamazon and cheery effect, you can mix and match multiple enamel bracelets. Enameling is a delicate process. As such, it can take up three to four days to produce one single enamel bangle.